Dodgers sign Will Venable, option Austin Barnes to Triple-A. The Dodgers have signed veteran outfielder Will Venable to a one-year contract and optioned Austin Barnes to Triple-A. Venable is available and will be in uniform (#25) for tonight’s game against the Arizona Diamondbacks in Phoenix. Venable, 33, has experience in parts of eight major league season, most with the San Diego Padres, giving him familiarity with Dodgers manager Dave Roberts and executive Josh Byrnes. He’s a career .251/.317/.406 hitter who can play all three outfield positions. Venable also has 135 career stolen bases in 166 attempts. His only at-bats this season came at the Triple-A level for the Philadelphia Phillies’ top affiliate. Venable slashed .205/.304/.307 for the Lehigh Valley IronPigs. Barnes was 2-for-19 with one RBI in 10 games with Los Angeles this season. Dodgers activate Chris Hatcher, option Austin Barnes to Triple-A Oklahoma City. The Dodgers will carry eight men in their bullpen for the foreseeable future and play the San Francisco Giants tonight with one fewer catcher than they had last week. Austin Barnes was optioned to Triple-A Oklahoma City and Chris Hatcher was activated from the paternity list one day after his wife gave birth. That means Adam Liberatore, who was recalled from Oklahoma City Thursday, will remain in the Dodgers bullpen as one of two left-handers along with veteran J.P. Howell. Manager Dave Roberts said he liked the idea of having two left-handed options against the San Francisco Giants and into next week against the Atlanta Braves as well. The Dodgers begin a three-game series in Atlanta on Tuesday. On the meaning of ‘ploach,’ and what A.J. Ellis and Robin Ventura have in common. SAN DIEGO — Austin Barnes is catching today, A.J. Ellis is catching tomorrow, and that’s a sentence I should probably copy and paste for future use this week. Dodgers manager Dave Roberts said he likes the every-other-day rotation between his two catchers. Barnes is 26 and just made his first Opening Day Roster. Ellis is 34 and has experience in parts of nine major league seasons. Maybe the best thing Roberts did in his pregame media scrum Tuesday was introduce a word into the baseball lexicon: Ploach. Dodgers catcher Yasmani Grandal might start the season on the disabled list. Yasmani Grandal was set to join the Dodgers in Anaheim for the finale of the Freeway Series. Friday night, manager Dave Roberts said the plan had changed. 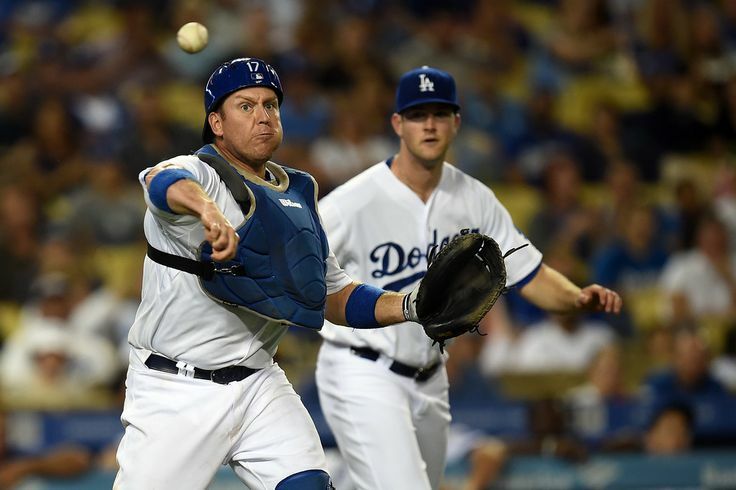 Grandal will stay in Arizona and play in a minor league game Saturday, “six or seven innings,” Roberts said. 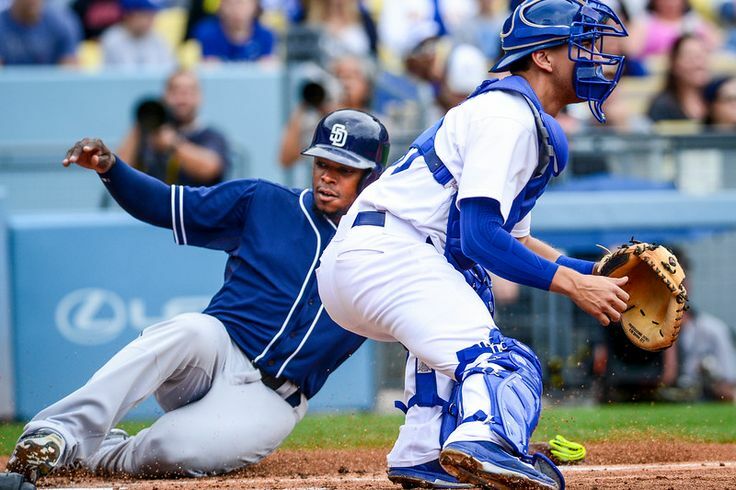 “He was OK coming out of (his minor league game) today,” Roberts said of Grandal. “Not great. Opening Day rosters must be submitted to MLB by 9 a.m. Sunday. If Grandal does begin the season on the disabled list, Austin Barnes figures to make the Opening Day roster along with A.J. Ellis. ‘Odds are decreasing’ that Yasmani Grandal will be healthy by Opening Day. GLENDALE, Ariz. — Maybe the most nerve-wracking thing about Yasmani Grandal’s strained right forearm is that it doesn’t hurt when he’s at rest. 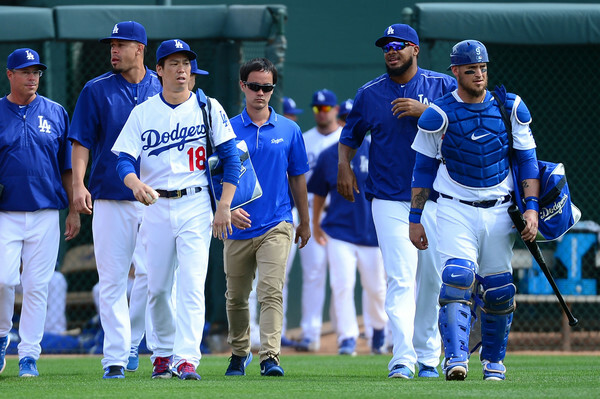 So the Dodgers catcher has stood at his locker and dutifully answered questions about the pain and says simply, honestly, that he isn’t in pain. But then he’ll get back to work and the pain will return, and that’s why he hasn’t appeared in a game since Monday. He won’t be back next Monday, either.